NY13's Evangelism School Offers Methods to Reach Other Major Cities. The Adventist Church’s International Field School of Evangelism is part of the denomination’s NY13 outreach initiative, which is launching a worldwide push to reach major metropolitian areas. The school is meeting at the Luso Brazilian Adventist Church in Corona, New York. 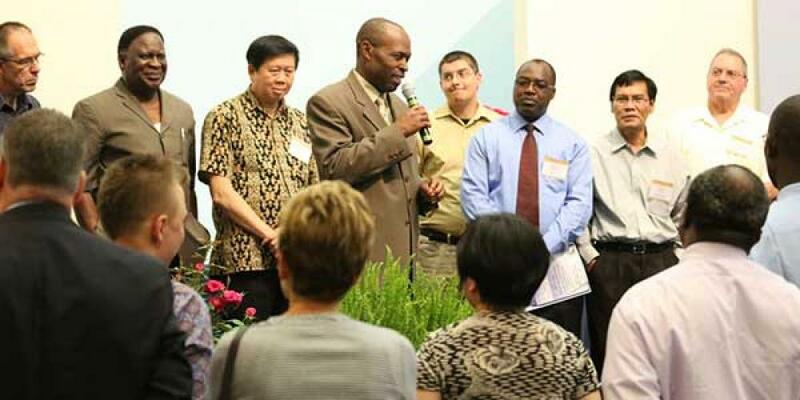 The Adventist world church has sent at least three people from each of its 13 world divisions to attend the school. The NY13 initiative is the first in the “Mission to the Cities” campaign, which was unveiled in 2011 by Adventist Church President Ted N. C. Wilson. This year’s outreach meetings and training in New York City are the basis for future outreach campaigns worldwide. The school is holding a full-length curriculum during the week from June 7 to 29, and an intensive class will be taught from June 23 to 29. More than 32 students have registered for both tracts, organizers said. Many students said the urban focus is key for their home territory. Kwon JohngHaeng, Adventist Mission coordinator for the Northern Asia-Pacific Division, based in South Korea, said his region has 23 metro areas with more than 6 million people. Abaribe said he will work to make sure future evangelism campaigns in his district will include several months of community service and involvement by church members, as well as follow-up work. “The feedback we’re getting is that in general people are very thankful for this school of evangelism,” said Robert Costa, associate secretary of the Adventist Church’s Ministerial Association and coordinator of the program. Costa said the focus is on conducting “blended ministry,” with a combination of personal evangelism and community service. The school is operating as the Adventist Church is holding more than 160 evangelism outreach meetings in New York City’s tri-state area. Those meetings followed months of several comprehensive outreach events, including prayer ministries, community service and health education events. The NY13 initiative will also host a June 29 mass campmeeting in Uniondale, New York, at Nassau Veterans Memorial Coliseum, home of the New York Islanders hockey team.